This long, flat cut of steak has great flavor on its own. Now add a Santa Maria rub, stuff with mozzarella and spinach, and throw it on the grill. It will surely impress your guests. TOTAL: 2 hrs. 15 mins. Two 8- to 10-inch skirt steaks laid out in strips. Trim steak of any excess fat or membrane (butcher will usually do this). Make rub: mix together the salt, garlic salt, celery salt, black pepper, onion powder, paprika, dill, sage, and rosemary in a bowl. Prepare your steaks by using a damp towel to lightly moisten the steaks with water, then pat with the prepared rub on both sides. Refrigerate the steaks for a minimum of 2 hours or overnight, for the flavors to fully come together. (If you are going to be cooking the meat right away, let rubbed steaks sit at room temperature for two hours. Unroll the steak and give it a fair coating of the rub, but not too much. 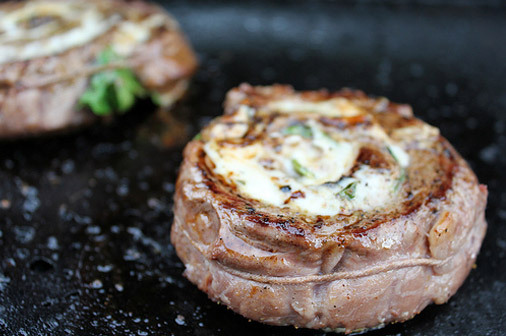 Add a row of smoked mozzarella cheese and fresh spinach along the strip of steak. 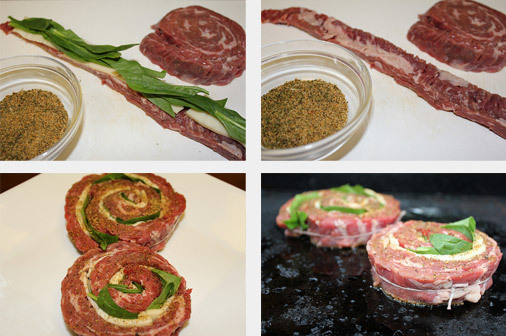 Carefully roll the steak with ingredients inside and tie it with butcher’s twine. Sprinkle with a bit more rub. Cook one side for about 4 minutes, then flip (go longer if your want a well done piece of meat).